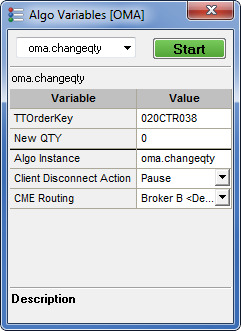 Order Management Algos (OMA) apply an algo to an existing order in X_TRADER. Once an OMA has been launched you can manage and monitor its progress from the Parent Order Book window or the Algo Dashboard window. Right-click the desired order and click Apply Algo from the context menu. Click the Algo button for the desired order. The Algo Variables [OMA] dialog box appears. Note: If you are applying an OMA to a child order already running an OMA you will be prompted to replace it. Clicking OK cancels the running OMA and possibly its child orders.